Lily has always been a big fan of cleaning. Yes apparently cleaning is fun. I do find it quite funny that children love to clean, little do they know it becomes one of the most hated and never ending tasks as an adult. I generally let her use a wet wipe and help me when I am cleaning something down. Though this isn't always helpful as wet wipes don't do a great job on windows or mirrors and this seems to be her favourite thing to clean. 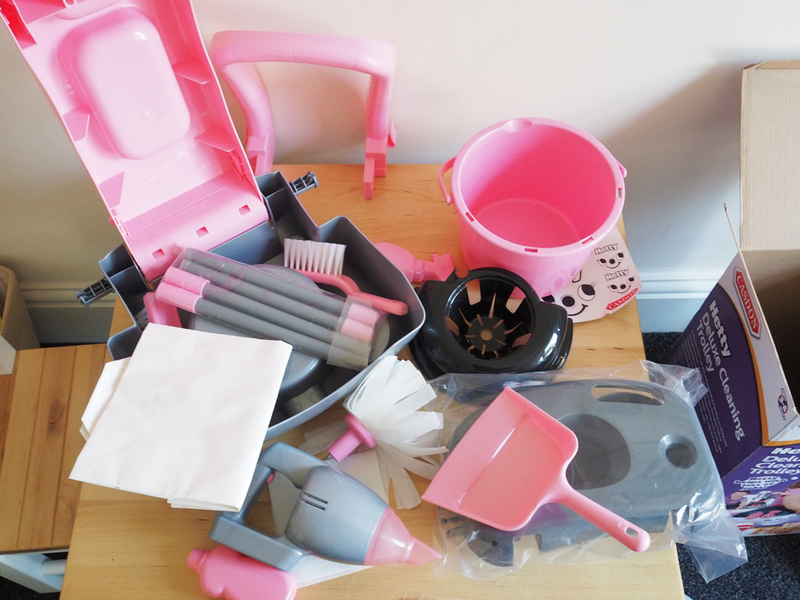 So when we got the opportunity to review a Casdon Cleaning Trolley I thought perfect. 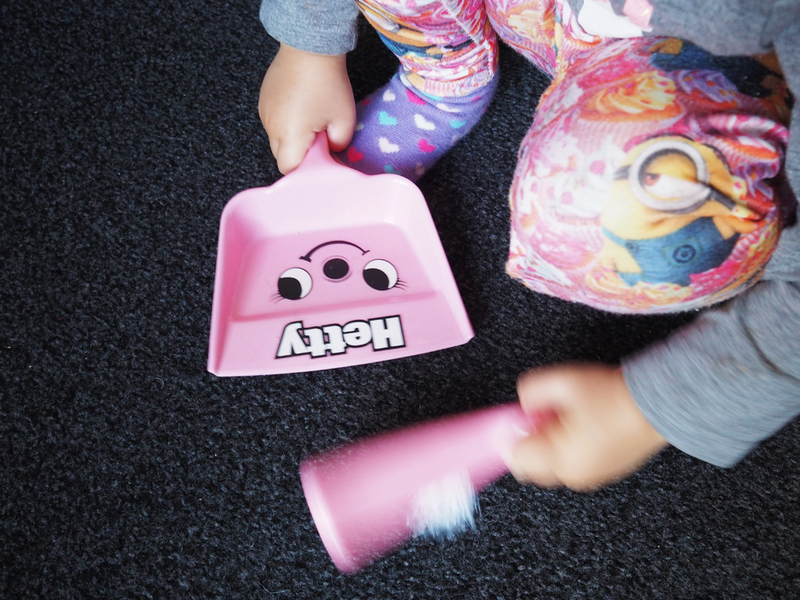 It was going to be brilliant to give Lily that chance to get to pretend play cleaning. The set arrived and it was actually a little bit smaller than I thought it would be. But this was actually a really good thing. We really are running out of the room for big toys. Be assured this fits nicely into any corner of a room and doesn't take up much space. We were really excited to take it out of the box. 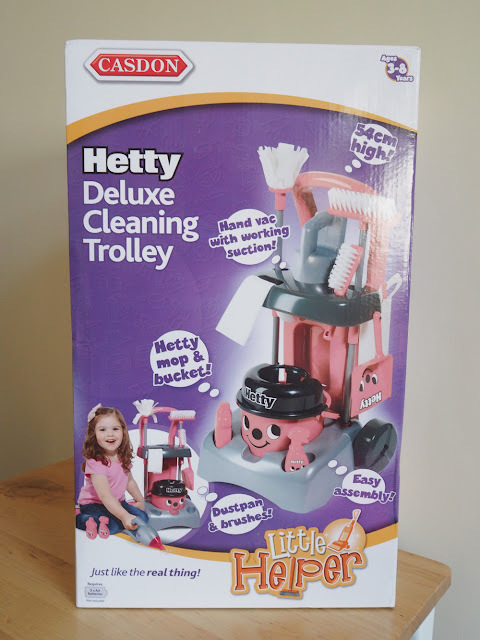 We got sent the Hetty version and you can also buy Henry. Lily is very familiar with Henry as we have a henry vacuum. She said "its a pink Henry" and so I said "yes, but her name is Hetty". When we opened the box, I noticed that the set had to be assembled. Oh no I thought. Please don't tell me that it is going to be really tricky to put together. Lily really doesn't have too much patience for me putting together toys. Luckily, as much as it looks like there is lots to put together, there isn't and everything just slots in nicely and quickly and you have it built in no time. You then need to attach the stickers to give it that friendly Hetty look. In total it measures at 54cm high and is the perfect height for any little one. The stand also comes on wheels so that it can be pushed from room to room. Something that Lily manages with ease. Lily loves playing with it all but she is mostly impressed with the hand held vacuum. It actually really works and has real sucking action just like any other hand held vacuum. Only this one is the perfect size for your child. I am just as happy about this part of the set as Lily is. Its perfect for when she drops her rice krispies all over the floor and can now clean them up herself. One less job for mummy to do! 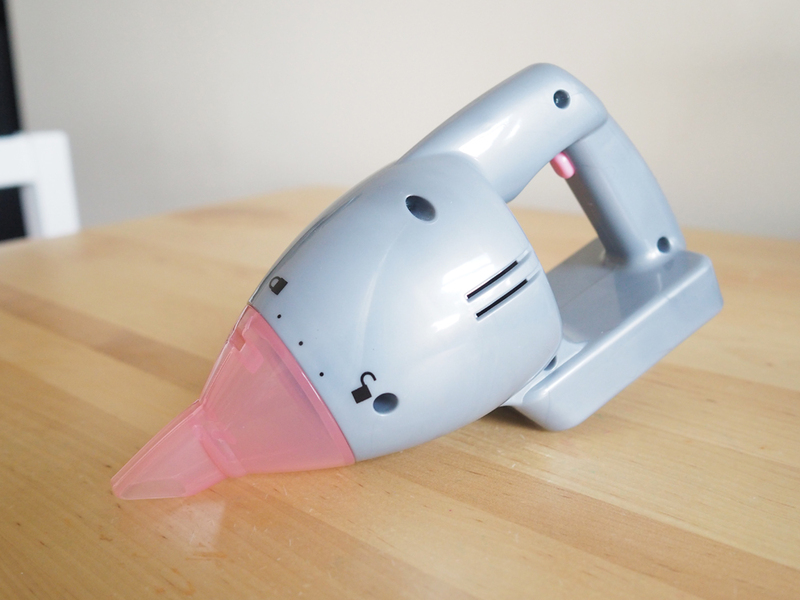 The vacuum is operated by a simple button that presses really easily and is very light to handle. It also isn't very loud so if you have a child like Lily who is frightened of loud noises, this won't scare them. Lily seemed to know exactly what to do with all the cleaning items. Shows that although my house never looks tidy, I must do a lot of cleaning. She would use the liquid bottle to put in some pretend liquid. Then she would dip in the mop and then wipe things with it. 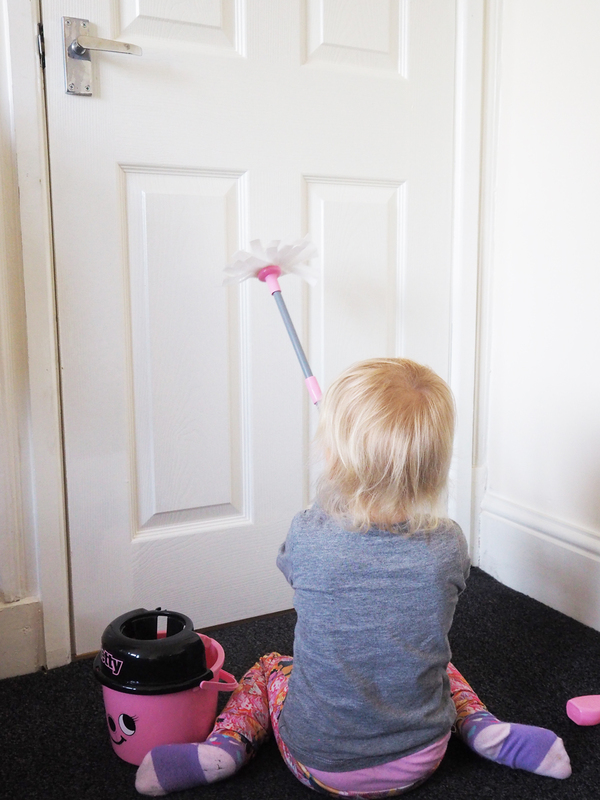 I say things because Lily did decide that the door needed a good clean with the mop and I can't say I have ever used a mop on a door before. Everything in this set was perfect to keep lily's role play imagination active. She has really loved using all parts to the set and everything really is like a mini version to what we would use cleaning our own homes. She has played with this toy every day since we have had it and its great to see her drop crumbs onto the floor and want to go to clean them up. It is never to early to start to teach your children how to clean. I would really recommend this toy for your child. It really does provide hours of cleaning fun for them and they really enjoy getting to feel adult and love joining in with the every day house work that needs to be done. This toy is perfect for a wide age range and is recommended for child from 3 year old all the way to 8 years old. At a price of £27.99 it is a perfect toy for all role play needs. £27.99 may seen quite expensive but when you actually look at the amount of items you get for it and the fact the vacuum works, it is well worth the money. Head over to the Casdon Website to see more about this toy or buy it from amazon. Do your children enjoy cleaning? Would they enjoy this toy? 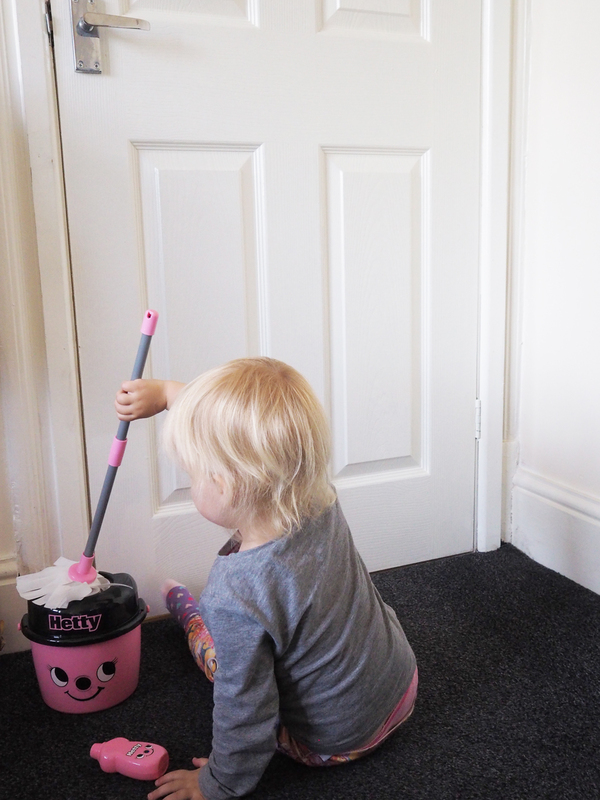 Every little girl I know loves to play cleaning, just wish it would last a life time though! I wish my daughter was more into play cleaning. It would be nice to have more help around the house. 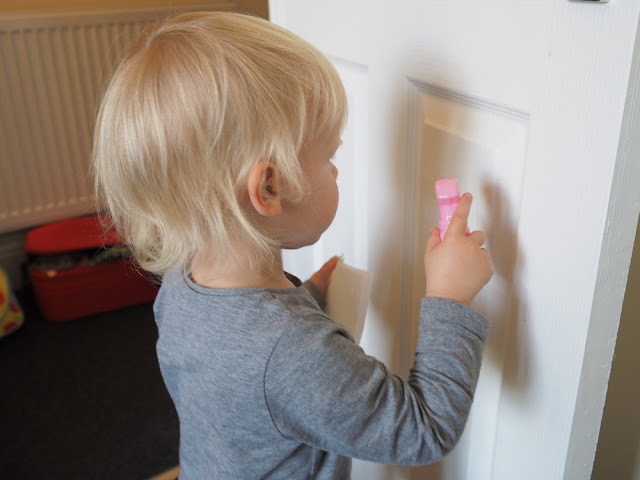 This is so cute - plenty to keep a little one occupied! Toy looks great. Reminds me of cleaning trolleys seen within shopping malls for their cleaning staff to use. My son would have loved this when he was smaller lol, he used to thoroughly enjoy 'helping'!